Spring is here and it’s a great time to do some spring cleaning, plant some flowers and open your windows for some fresh air. There is no better time to spend outdoors in Houston, Texas, unless you have allergies of course then the spring season. There are many outdoor activities, sporting events and barbeques to attend and while these may be fun often times you leave with some serious stains on your clothes. It can be difficult to get mustard or ketchup stains off your white shirt or remove pesky grass stains from your soccer or football uniform. Oftentimes it appears that your clothes are ruined for good, but don’t fret because we have some laundry tips that will have your clothes looking fresh and new again! Below are some of the most common stains and how to get rid of them. Step 1: Assess whether the sweat stain is old or new. If it is old it may have started to change the color of the fabric because of the acidity of the perspiration. Hint: Do not apply both ammonia and vinegar to the stain at the same time. Because vinegar is a mild acid, and ammonia is an alkaline solution, they will just neutralize the effectiveness of both if combined together. Step 3: Rinse either the vinegar or ammonia from the fabric. Step 4: Apply a laundry pretreater containing enzymes, or blot liquid laundry detergent containing enzymes onto the stained area and let it sit for 30 minutes. Step 5: Wash in the hottest water the garment will allow to get out the spot. Hint: Make sure it is gone after washing, but before you place in the dryer or you may set it. Repeat if necessary. Step 6: For really stubborn sweat stains you can also try relaundering with either chlorine bleach, if safe for the fabric, or color safe bleach if not, in the hottest water also safe for the fabric. GRASS STAINS – Stains caused by grass are problematic to remove because they are a combination of dirt and grass and they also set in pretty quickly. The faster you act to remove the stain the better the outcome. contains enzymes. Alternatively, you can also use baking soda and dish soap to create a paste or one of my favorites stain remover that is super convenient is Carbona Stain remover. You may find these at HEB, Walmart or Krogers Supermarket. Carbona Stain remover is Divine! Step 2. 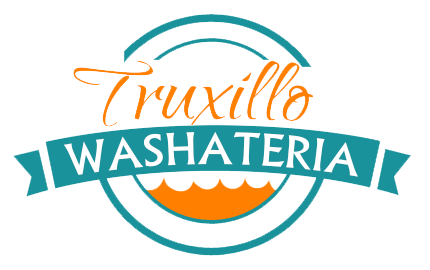 Wash in the hottest water possible for the type of garment being cleaned and if possible use a color safe bleach. Before you move the garment to the dryer make sure the stain is gone otherwise you the dryer may set the stain in for good. If the stain doesn’t come our then repeat the steps above or soak stain overnight. 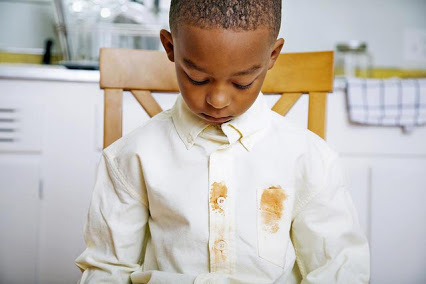 KETCHUP STAINS – Our family loves ketchup! It’s a necessity for our outdoor barbeques and we all know that ketchup stains with kids are inevitable and some adults too. Again, on must move quickly to remove ketchup stains. Step 1. Scrap off any excess ketchup on the garment. Step 5: Sponge the area with white vinegar, make sure to use a clean white cloth. A microfiber one is best. Note: Make sure the stain is gone before you put in the dryer. Repeat the steps above is necessary. MUSTARD STAINS – Oh those pesky bright yellow mustard stains. Again with most stains, the quicker you begin treatment the better. Step 1: Scrape off any excess mustard from the fabric. Step 2: Turn the fabric, inside out, under the cold water to flush out as much of the condiment as possible. Step 3: Pretreat the stain with a prewash stain remover. Step 4: Wash in the hottest water the garment will allow to get out the stain, and use a color safe bleach. Step 5: Check to see if the stain is gone. If not, then rub glycerin into the spot with a soft brush or your fingers, and let it sit for approximately 15 minutes. Step 6: Rinse the stained fabric off with cool water. Step 7: Repeat step 4, and rewash the item. A few years back, I was on my way to meet a contractor to pay him for a job he had completed for me. The contractor lived in some apartments adjacent to this neglected and abandoned laundromat. The laundromat was severly damaged due to Hurricane Ike and was for sale. As I looked at this laundromat I wondered what happened to this business? Why did it close? Was it ever successful and, if so, what happened? Would it be possible or smart to revive this business and, if so, would the customers return? You know the types of questions any entrepreneur will ask themselves when they see a potential opportunity. However, within a matter of seconds I had quickly talked myself out of this opportunity. After all, what do I know about the laundry business? My contractor arrived and I paid him his cash. I drove away without another thought regarding this abandoned, neglected close laundromat. A few months later, I had to meet the same contractor again to make another payment on the job. To my surprise the building was still for sale – boarded up and looking neglected, just like before. I thought to myself why hasn’t anyone purchased this business? So I took down the contact information just because my gut was a bit stronger and leaning more towards analyzing this opportunity than before. I decided to ask my contractor if he knew anything about this business and, if so, what did he know. Well, this was like opening up pandora’s box because not only did he know the history of the existing business but he also knew the previous owners who eventually ran the business into the ground. He told me that this business had served the community for many years and that he believe that it still could if someone would take a chance and bring it back to life. So, I decided to conduct some due diligence. I went to every laundromat in the nearby area to check out the competition and this is where things got REAL. The laundromats were deplorable! I couldn’t believe that they were operating under such neglected conditions. 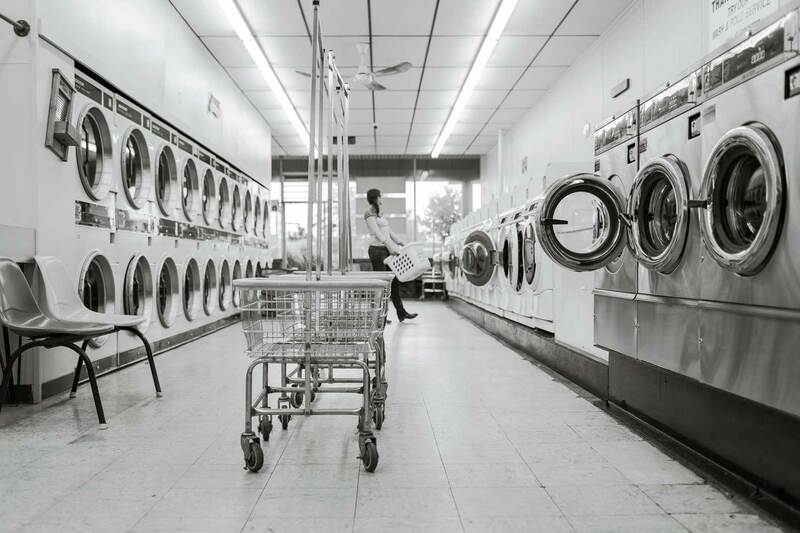 Many of the laundromats were dirty, had broken equipment, people loitering outside, no amenities such as WIFI, TV’s, snack machines and laundry baskets. The most appalling was many didn’t have central air conditioning. Can you image a laundromat in Houston operating without air condition especially in the summer months? Well, after my visits to the competition it was pretty clear to me that the people who lived in the community deserved better and I wanted to provide a better overall experience for them. So, I called that number on the for sale sign and bought the business. I reached out to vendors, laundromat owners and anyone who had experience in this type of business. I took on this task and it was bumpy, gritty, hard and costly but my I was so proud when I opened the doors almost 9 months later. The business was spotless, we had air conditioning, working equipment, TV’s, WiFi, sitting areas, laundry baskets, snacks and drink machines. Customers gave instant positive feedback. The business grew over the months as well as positive feedback. I had many customers tell me stories about when their grandmother’s useed to bring them to this laundry as kids and now they are in their 50’s or how they use to come to wash here decades ago but stopped coming because it was so run down. These type of stories are priceless. I enjoy running this laundry because it provides a much needed service with respect and dignity. I’ve met so many good, hard working class people over these past 9 years. I even had a chance to watch some of their kids grow and it’s a pleasure to serve them.